Introduction Previous research in the Nurses' Health Study (NHS) and the NHSII observed that, among women diagnosed with benign breast disease (BBD), those with predominant type 1/no type 3 lobules (a marker of complete involution) versus other lobule types were at lower risk of subsequent breast cancer. 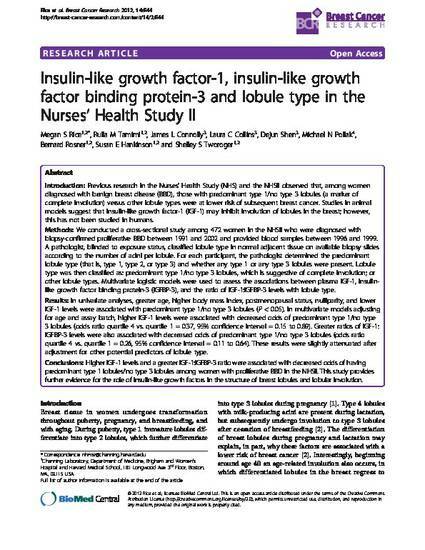 Studies in animal models suggest that insulin-like growth factor-1 (IGF-1) may inhibit involution of lobules in the breast; however, this has not been studied in humans. Methods We conducted a cross-sectional study among 472 women in the NHSII who were diagnosed with biopsy-confirmed proliferative BBD between 1991 and 2002 and provided blood samples between 1996 and 1999. A pathologist, blinded to exposure status, classified lobule type in normal adjacent tissue on available biopsy slides according to the number of acini per lobule. For each participant, the pathologist determined the predominant lobule type (that is, type 1, type 2, or type 3) and whether any type 1 or any type 3 lobules were present. Lobule type was then classified as: predominant type 1/no type 3 lobules, which is suggestive of complete involution; or other lobule types. Multivariate logistic models were used to assess the associations between plasma IGF-1, insulin-like growth factor binding protein-3 (IGFBP-3), and the ratio of IGF-1:IGFBP-3 levels with lobule type. Results In univariate analyses, greater age, higher body mass index, postmenopausal status, nulliparity, and lower IGF-1 levels were associated with predominant type 1/no type 3 lobules (P < 0.05). In multivariate models adjusting for age and assay batch, higher IGF-1 levels were associated with decreased odds of predominant type 1/no type 3 lobules (odds ratio quartile 4 vs. quartile 1 = 0.37, 95% confidence interval = 0.15 to 0.89). Greater ratios of IGF-1:IGFBP-3 levels were also associated with decreased odds of predominant type 1/no type 3 lobules (odds ratio quartile 4 vs. quartile 1 = 0.26, 95% confidence interval = 0.11 to 0.64). These results were slightly attenuated after adjustment for other potential predictors of lobule type. Conclusions Higher IGF-1 levels and a greater IGF-1:IGFBP-3 ratio were associated with decreased odds of having predominant type 1 lobules/no type 3 lobules among women with proliferative BBD in the NHSII. This study provides further evidence for the role of insulin-like growth factors in the structure of breast lobules and lobular involution.